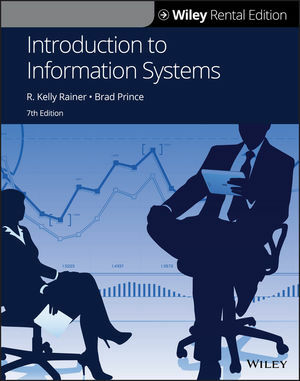 The goal of Introduction to Information Systems is to teach undergraduate business majors how to use information technology to master their current or future jobs. Students develop a working understanding of information systems and information technology and learn how to apply concepts to successfully facilitate business processes. This product demonstrates that IT is a key component of any business, whether a student is majoring in Accounting, Finance, Marketing, Human Resources, or Production/Operations Management. Data Analytics: A new section on the growing and dynamic area of Data Analytics has been added to the course. A Broader Focus: This course has been updated to include a beefed-up section on security to address the latest trends and concerns in the field. New and Updated Cases: Additional “IT’s About Business” cases and updated videos have been added for each section of the course. The video lectures covering each learning objective have proven to work particularly well for blended, flipped or on-line course offerings. Students watch preparatory video lectures outside of class, enabling professors to use in-class time for discussion, analysis of cases, and other activities that engage students in the material. What’s in IT for me? : This instructor-praised feature demonstrates how IT topics relate to students in business majors such as Accounting, Finance, Marketing, Operations Management, MIS, and Human Resource Management. Section-opening teasers list specific tasks for each major learning objective, helping students gain mastery of the section content. IT’s About Business: Several “IT’s About Business” cases are included in each section of the course and feature vivid examples from large corporations, small businesses, government, and not-for-profit organizations to show the connection between IT and business. Technology Guides: These guides offer additional material on technology topics not included in the main curriculum, as well as current hot topics in IT. New and updated information on Cloud Computing and Artificial Intelligence are covered in the Tech Guides. There is also more detailed information on computer hierarchy, the CPU, Systems Software and Applications Software. Concise and Engaging: The narrative throughout each course section provides the important facts that students need to know for concept comprehension without overwhelming them with details.